how to respond in various ways to media constructions of events and issues. What is the White Australia Policy? How do the nicknames of the various Prime Ministers and the Warren Brown’s sketches influence your view of these men? Why is the viewer informed early in the clip that Edmund Barton’s nickname was ‘Tosspot Toby’? How did he acquire this nickname? Is any evidence provided to support this? How does Brown’s narration try to use language in a way that the implications of this nickname are dismissed? 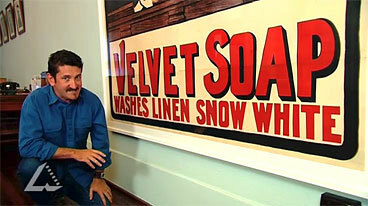 What was your initial reaction to the Velvet Soap advertisement? How did this change by the end of the film? Did the historical context enable you to read the advertisement ‘better’ or ‘differently’ from how you would have otherwise? Pause the film and analyse the way that visual and written language is used in the advertisement. What are the possible literal and connotative meanings of this advertisement? What effect do different visuals have on the way the slogan ‘washes linen snow white’ might be read? Of what does ‘snow white’ remind you? Who could laugh at this advertisement and accept the ‘messages’ as natural and commonsense? Why does Brown suggest that contemporary readers might cringe? Does this advertisement deserve to be a national treasure? Do you accept Brown’s justification? Imagine you are a Pacific Islander, Torres Strait Islander or indigenous Australian. Create a new narration for this film which tells the story from your point of view. Drawing on your knowledge of contemporary events, design and produce your own advertisement for a product such as soap. Prepare to ‘pitch’ this advertisement to your client – you will need to explain why it would be effective for the target market. Analyse and evaluate the textual and cultural resources used in a current advertising campaign. Present this as a speech to the class (accompanied by a PowerPoint presentation) or as part of a website. Uncover some other little known or obscure stories from Australian history and tell these as part of a class or school storytelling festival.